Clearly is a Canadian online specialty retailer offering contact lenses, glasses and other designer eyewear. Consumers review the retail store positively for its affordable prices, good customer services and a friendly returns policy. Most popular products include daily contact lenses and designer glasses. Merry And Bright! Get $25 off $100 or $50 off $175 or $100 off $250. Premium Brand Sale! Get 20% Off Ray-Ban, Oakley & More Frames + Extra 20% Off prescription Lenses & Free Shipping with Free Return. All glasses, with the exclusion of rimless and semi-rimless frames, come with free Standard Lenses. Excludes Contact lenses. Save 20% on exclusive brand frames including Derek Cardigan, Love, Kam Dhillon and Joseph Marc. New Customer Offer! Get 30% Off your first pair of glasses & Free second pair + Free shipping on your first order. For a limited time only. Get 15% off contacts & 50% off glasses + Free shipping when you sign up for email updates. For new customers. Get 13% Off your order. Save 10% on select items. Get free shipping no minium. 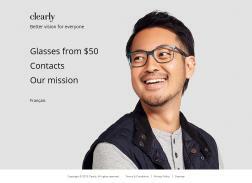 Buy a pair of glasses at $50 or more and get a second pair for free. Excludes the sale section. Includes free shipping. See site for terms and conditions. Save 10% off select frames. Get Free Shipping on Contact Orders $49+. Excludes contact lens accessories such as lens cases, solution, and eye drops. Get 15% off designer sunglasses + Free shipping. BACK POCKET SALE! Entire site marked down and 50% off complete orders! Get free shipping on your Contacts order. Save 15% on select glasses.